One imagination of the Haymarkey Plaza from the Downtown Riverfront Redesign plan in 2011. Ever wanted to hold a greater stake in your community? Well, you can start by just being a good neighbor, voting in elections and paying attention. But a more concrete way you can jump into community involvement is by taking part in a couple of placemaking workshops regarding the proposed Haymarket Plaza in downtown Eau Claire. The city of Eau Claire owns the property and expects to create a public plaza on the space in the future, but they’re taking that “public” word to a whole ‘nother level. The city, partnering with the West Central Wisconsin Regional Planning Commission (we’re just gonna call that the WCWRPC from now on so I don’t have to type that mouthful anymore), will be engaging in a program they’re calling Placemaking The Plaza, which will bring citizens and experts into workshops together to figure out how to make the space shine. 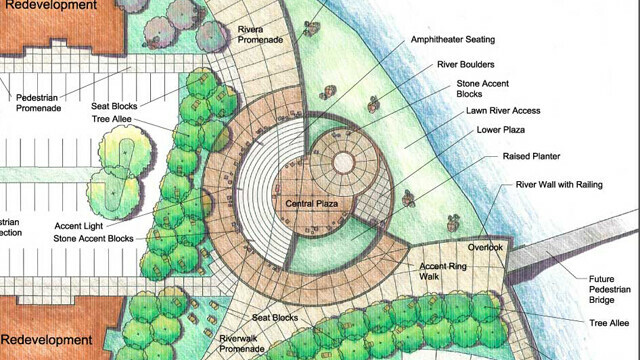 The plaza has been (and could be, physically) at the center of the Confluence Project – the proposed arts center and multiuse building to sit long the two rivers. But even if the Confluence Project doesn’t go through, the city would still own the lot and do something with it eventually. The workshops – which will be held at The Plus (formerly Pizza Plus) Wednesday, Nov. 6 and Saturday, Nov. 9 – will be based around specific theories of placemaking from the Project for Public Spaces, including the Power of 10. The basis of Power of 10 is that you need more than one reason to be at a public place. These reasons can be everything from a public sculpture to a nice bench to a flower bed. But Power of 10 goes beyond that (and this is where the “power” comes in): Each one of these spaces with 10 attractions can contribute to a neighborhood with 10 good spaces, which could contribute to a community with 10 good neighborhoods and so on. Hopefully this placemaking exercise could be the start of something bigger. During the workshops, WCWRPC representatives will be leading citizens through a number of exercises, figuring out what makes the Haymarket Plaza unique geographically, how it fits into the current and future downtown landscapes, and discussing what future uses and design features people might like to see. After the workshops are completed, the organizers will compile a report of findings and present them to the city later this year. If you want to join in one of the these workshops and let your voice be heard – and listen to your neighbors to get an idea of their opinions – you need to register at WCWRPC.org by Nov. 1. Sessions will be held at The Plus, 208 S. Barstow St., on Nov. 6, 4-7:30pm, and Nov. 9, 9am-12:30pm. You must register before Nov. 1 at www.WCWRPC.org.